Saturday was the most beautiful day of the entire year so far! It has been almost 6 months since we've had jacketless weather so there was no way we were going to let this day go to waste! We hopped in the car and headed to the nearby city of Bayreuth. After a quick 45 min drive we parked and headed out to explore. The town's roots date back to 1194 and today is is the capital of the Upper Franconia region of Bavaria and home to over 70,000 people. Despite its size, the city remains quite tame most of the year until the Richard Wagner Festival, also called the Bayreuth Festival, comes for 30 days each summer. The festival is world famous and is host to performances of operas by...you guessed it! Wagner. 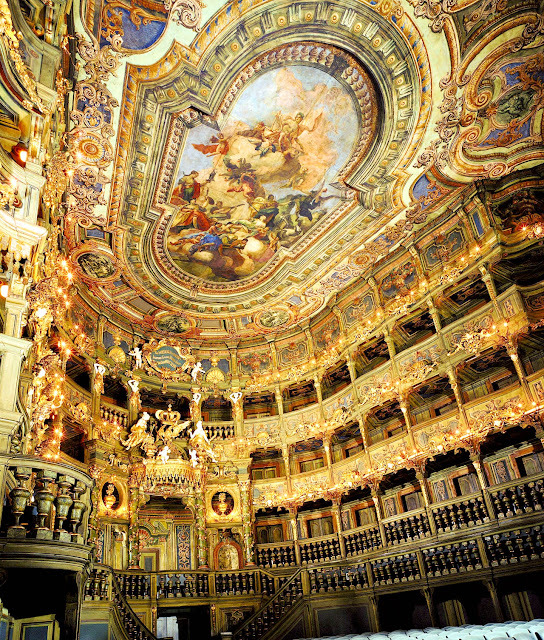 One of the most famous sights in the city is the Margravial Opera House. The structure was built in 1748 and designed by Giuseppe Galli Babiena. 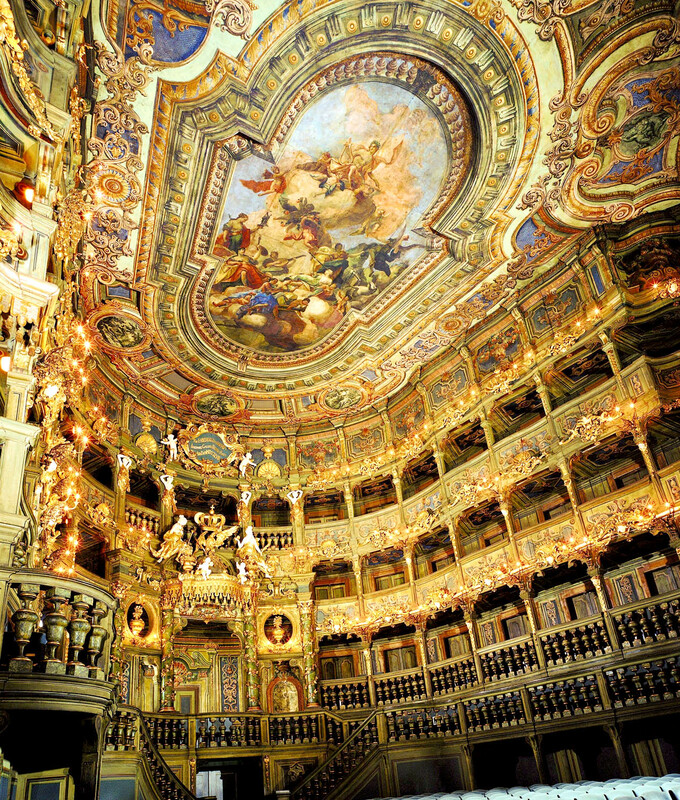 It was the largest opera house in Germany for over a century and is still one of the most ornate baroque opera houses in the world. There were other beautiful sights to see in the city so we pressed on. We enjoyed walking down Maximillianstraße. Peeking down through the lane towards the Stadtkirche. The town already had their Maypole up and there was a fun market going on, too. 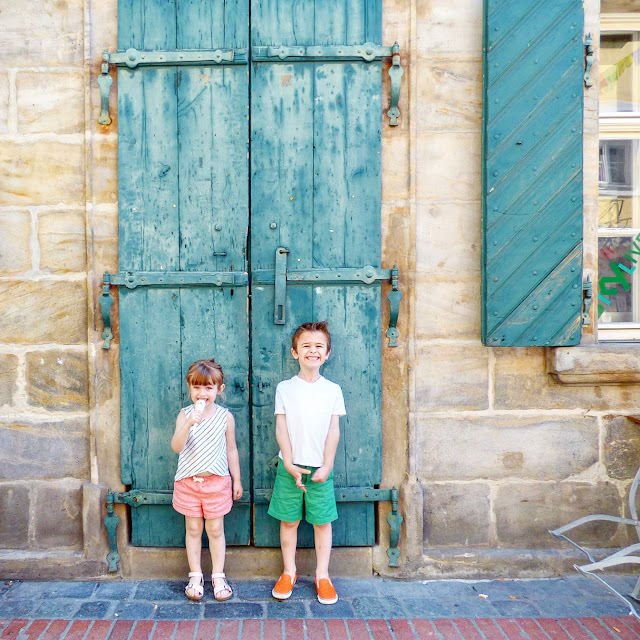 I spy our two little kids traipsing through the market. As Chris said when he grammed this picture, "Germany is the wurst." And then my mom said, "I never sausage a thing!" Lol. Lovely church fronting the square on Maximillianstraße. We didn't really have any plans so we wandered wherever we felt like it! We saw this cute street so down it we went. The twin towers of the Stadtkirche. We walked in because we heard someone playing the organ. As soon as we entered it stopped. We looked around a bit then left, and as soon as we did the guy started playing the organ again! Ha! Peeking above the buildings you can see the tower of the Castle Church. It was built in 1758 and is the burial vault of Friedrich and Wilhelmine. Our family in Bayreuth, Germany on Saturday, May 7th, 2016. In front of the Castle Church and Tower was this huge dinosaur. So random! Then we went to see the Neues Schloss, the former home of Margrave Friedrich and his wife Wilhelmine. It was built in 1754 and designed in an Italian style. Behind the palace is the Hofgarten. It was the perfect temperature as we soaked in the sun and smelled the roses. I dunno why but I love this little corner. Tulips leading to the palace. Peeking into one of the courtyards with flowers of every color. The kids playing in the fountain in front of the palace. We meandered back to the car and drove the short way home. Such a fun day trip! Love to see my birth town. Loving all the photos!! That is so random about the organ player/playing ... like he was a phantom! LOL!! And loving the Wurst/Sausage comments!!! HA!!!!!!!!! !